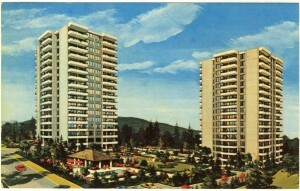 I don’t have too many Burnaby BC postcards in my collection, but here’s one offering buyers some ‘early’ apartment towers built along Lougheed Highway, near the Brentwood Mall. (The area is sometimes called Brentwood Park). My parents bought a house a bit further east in the same area in the early 1970s. The attraction to them was the area’s nearness to Simon Fraser University as my mother wanted to go back to school. And the house was carpeted; Mum was sick of polishing hardwood floors. How times and fashions change. 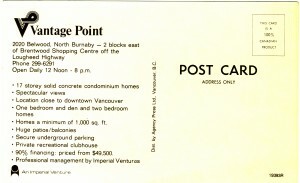 The address given for Vantage Point on the postcard is on ‘Belwood’. Today it’s ‘Bellwood’. I must look to see which the name was originally. And there’s no mention of public transit, of course, although Lougheed Highway had good bus service then – direct service to North Burnaby and Vancouver – and good connections to other parts of Burnaby and further afield. The expectation, I believe, as now, is that people will have their own vehicles. Brentwood Mall, built in 1961, and expanded in 1970, was a bit of an attraction, I suppose, although my own early memories of it are slim. I do remember my father buying me a birthday bottle of Kahlua in the government liquor store at Brentwood though, probably in 1970. There was a grocery store there too in the early days, unlike now. Lately there’s controversy around proposals for redevelopment of the Brentwood Mall area. I know I tend to be somewhat blasé about plans in Burnaby (and New West); sometimes it seems we’ve heard this all before. But both Brentwood and Lougheed Mall suffered after the opening of the Skytrain line. A movie theatre at Brentwood – that might be good. (I’d say bringing back the drive-in would be better even if I don’t approve of private vehicles.) But a hockey viewing area? BAD. And what about a civic recreation centre and a library, City Council! Over at the Brentwood Station blog, someone’s following and reporting on all the latest Brentwood area news, if you are interested. And David Pereira is posting some of his urban Burnaby research on-line. Lots of interesting recent history there which might inform your ideas of the future. 1 What lies ahead for Burnaby in 2012? by Janaya Fuller-Evans, Burnaby Now January 4, 2012.